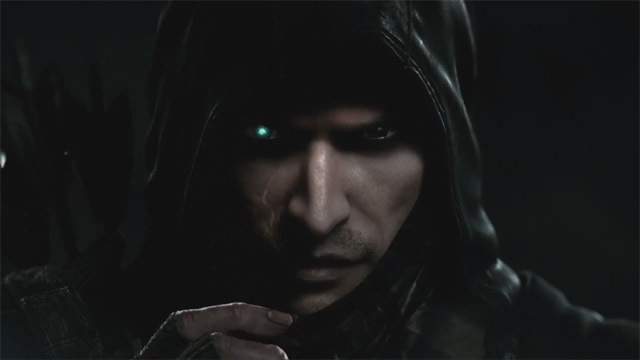 As promised, Eidos Montreal has released the official debut trailer for Thief, which gives us a very cinematic glimpse at how next generation console sneaking and stealing will look during cutscenes. Unfortunately, the trailer features a distinct lack of candle snuffing gameplay, however, a very chatty Garrett does point out all the necessary ingredients to pull off “the perfect heist”. The Thief announcement trailer opens up with Garrett (who appears to be voiced by someone not named Stephen Russell) preparing his equipment for a heist. Once out on the darkened city streets, Garrett spots his target — an expensive jeweled necklace resting on the neck of a wealthy woman — and follows its owner and her heavily armored bodyguard to a large mansion. The master thief then sneaks past guards and breaks into the house’s creepy, bird cage-filled, attic (because that is apparently where all rich women keep their valuables). In short order, Garrett has the safe locked picked, grabs the necklace, and makes a daring escape by jumping out a window. We are then treated to our first look at the unshaven Garrett, before the trailer closes with the Thief logo (which is snatched up by Garrett) and the tag line, “What’s yours is mine”. Overall, the Thief trailer looks very impressive, although Eidos Montreal is clearly not showing off any in-game footage. Hopefully, the actual title matches the visuals what we are seeing here, and (more importantly) has the gameplay to back it up. The wait for the fourth game in the series has been long, and the move to next generation consoles has only raised expectations. Square Enix is planning to launch Thief sometime in 2014 for the PlayStation 4, PC, and “other next generation consoles” — which we assume means Microsoft’s unannounced Xbox 720/Durango. Check out the official announcement trailer below, and make sure to drop a line in the comments with your thoughts on Garrett’s return.